I will add more photos and video when the sun comes! I get really jazzed when I find inspiration from repurposing material often found in my home, in nature or from an unlikely place, like an office supply store. The office supply store was strangely inspiring as it may be one of the few retail spaces that I have visited this month that was not gussied up for the holidays. Naturally, I was thinking about what I could do to spruce-up the joint with the materials I was surrounded by. ‘Tis the season to need a last minute gift. This project is easy on the wallet, quick to create and surely will add twinkle to anyone’s eyes. Make a few of these in advance so that you can keep one on your holiday bar cart! Step One: Prep the bottle by removing any price tags and then add painters’ tape to protect any surface were the beverage may touch. Step Two: Generously spray the bottom portion of the bottle with the spray adhesive. Sprinkle the glitter onto the bottle that has adhesive. It looks great to create an ombre effect on the bottle by using three different colors of glitter. Step Three: Spray the glitter portion of the bottle with a clear glossy adhesive. This product typically has a strong odor so I strongly recommend doing this portion of the project in a well-ventilated area or outdoors. Let the project sit for an hour before removing the painters tape and adding a gift tag. This DIY project will personalize your guests’ experience, is an instant conversation started, and hopefully will cut-down on unclaimed beverages. Encourage guests to take their tags home to be added to their trees, Christmas stocking or to top their gifts. Step One: Print color copies of your friends. I put six photos per 8X10 sheet. Step Two: Turn your laminator on and select desired heat setting. While laminator is heating-up, insert your color copies with the photos of your friends into the laminator pouch. Step Three: Insert the laminator pouch into the laminator. Gently guide the laminated sheet out of the laminator. Step Four: Cut the laminated photos into your desired shape. I used a large circular hole punch and then used a very small hole punch to the top of the photos, this is where you will add a wire loop. Step Five: Create a smaller area on your bar for guest to personalize their drink tag. Include wire, buttons and beads. We purchased our Christmas tree this year and it was bundle-up with a large white net, which seemed unnecessary. I really wanted to figure out a way to somehow include this net into our holiday décor. This net paired with balloons and decorative hooks that won’t damage the wall, makes an impactful countdown activity to a New Years’ Eve party. Step One: Tie one end of the netting. Step Two: Lay the net on a flat surface and cut a straight line from the knotted end to the open end of the net. Step Three: Weave twine or fishing line to close the netting that you just cut. This will be the area where the balloons will drop-out-of. Leave a long section of the twine or fishing line as you will need this to pull through the net to release the balloons. Step Four: Fill the netting with blown-up balloons. No Helium needed. Step Five: Tie the open end of the netting. Step Six: Attach the ends of the netting to the Command Metal Hooks. Step Seven: When you are ready to release the balloons, pull the twine or fishing line through the net. Voila, in home balloon drop! The Holiday season is a natural time to celebrate, reflect, and give thanks. It is also a time of year that can easily be overwhelming with get-togethers and gift-giving. Today we will make thoughtful and resourceful, handmade gifts that will no doubt make you and your loved ones focus on the beautiful simplicity of giving. I was asked to make these crafts using curtains as we are paying homage to the musical, ‘The Sound of Music’ on TCL. In the musical, the lovely character Maria, makes fun clothing for the children out of curtains. As a child, I always looked forward to attending family holiday parties because it meant that I would be able to spend time with my cousins. Some of my favorite memories are playing Barbies with my cousins in my aunt and uncle’s big closet. Please note, my family did not request or suggest that we play in the closet, we just love the idea of a fort. My cousins and I thought it was really fun to have a space all our own. For this project, I used two large panel curtains that I purchased, second hand at the Arc’s Value Village. These curtains were priced under $10. I went to Home Depot and purchased five 1x2 pine boards. These boards are six feet and will not need to be cut to make the A-Tent-Frame. I also purchased one 1x3 board that I asked to be cut in half. This board will be used as a support on the bottom of the A-Tent-Frame. I purchased eight bolts that I drilled on the top and bottom of the A-Tent-Frame. I used one of the 1x2 to string the tab curtains on and then I put this on top of the A-Tent-Frame. All the wood and bolts were under $20. This is the easiest and most charming craft and it’s perfect for the holidays! In my quest to find cute curtains for this, ‘Sound of Music’ theme segment, I found a great holiday plaid. This plaid is so darling on its’ own, I wanted to keep this craft simple. I also purchased a plain white curtain and a lace curtain for this project. All of these curtains were under $5 at the Arc Value Village. I went to the craft store and purchase the smallest embroidery hoops. I cut the curtain in a circle a little bit larger than the hoops. After I secured the curtain swatch in place, I then embellished with ribbon and bows to make this a holiday ornament. This would be a fun craft to with a favorite piece of clothing that is no longer wearable. I was really drawn to the lace detail of one of the curtain panels. I thought the lace would resemble snow if imprinted in clay. I purchased inexpensive clay from the craft store. I made small flat circles, punch a hole through the top of the clay, and then started pressing the lace details into the clay. I then added a bit of paint and fine glitter to the lace imprint in the clay. The lace detail is very fine and understated. I wanted more of an imprint so I grabbed my cranky cat and placed her paw into the clay. I was pleased with the imprint she was not. I baked the clay ornaments at 150 degrees for 10 minutes. After the clay cooled, I cut thin pieces of curtain to then string through the clay discs to make a holiday ornament. 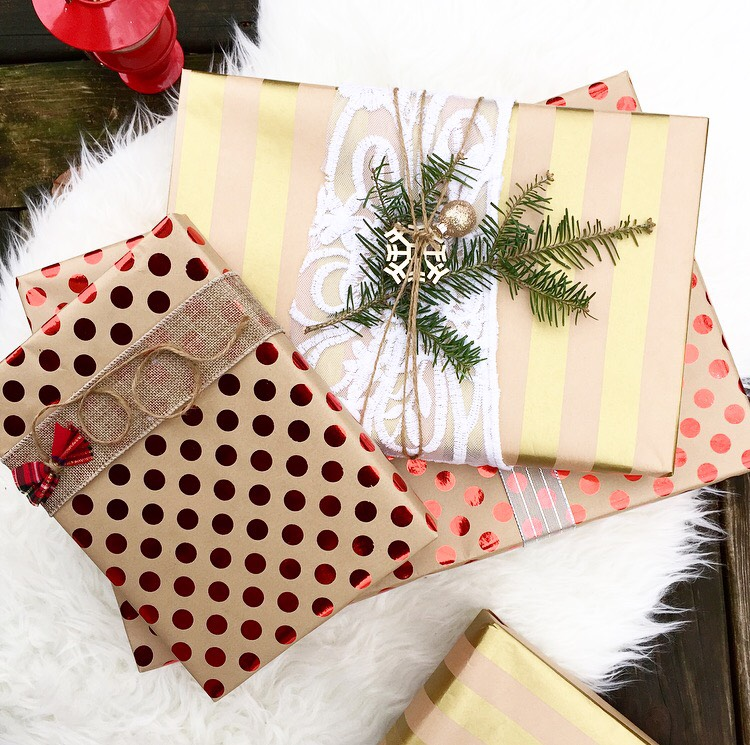 All of these gifts need gift wrap! I loved the patterns, textures, and colors of the left-over curtains scrapes from my crafts. I used thin pieces of the curtains to embellish my holiday gift wrap. Here’s to a wonderful season of thoughtful and resourceful gift-giving! Pumpkins are a perfect decoration to add to your home during the autumn season. In addition to being a staple to doorsteps and front porches on Halloween, pumpkins are awesome to bring indoors to decorate a mantel, a dining room table or a mini bar. When purchasing pumpkins to carve with your family, purchase a few additional pumpkins specifically for home décor. Pumpkins have a great shape and look awesome when paired with succulent plants. Succulent Arrangements on my DIY Cedar Plank Rug. Purchase a small cluster of mini succulent plants at your local hardware or garden store. Group the succulents together and place the roots and a small amount of dirt in a plastic sandwich bag. Trim or fold the top of the sandwich bag to ensure the succulent foliage is above the bag. Loosely tie ribbon or twine around the sandwich bag to keep dirt from spilling out of the bag. Place the succulents in a carved pumpkin. Decorate the outside of the pumpkin with natural elements such as moss or twigs. These make great host gifts or gifts for neighbors. Pumpkins have a great shape and look awesome when paired with flowers. Carve your pumpkin as you would a typical Jack O'Lantern, make sure the opening of the pumpkin is wide enough to place a vase inside. Carved pumpkins have the same life expectancy as a floral arrangement when kept inside. Fill a vase with water and place inside the pumpkin. Add fresh cut flowers to the vase. These arrangements look beautiful on any harvest table. Pumpkins look magical when painted. If you don’t have time or energy to carve a pumpkin, get some paint and paint directly on the pumpkin. Pumpkins also look great when spray painted. Halloween is a magical holiday for children and adults. It’s a celebration of creativity and an invitation to be anyone or anything. It’s a free pass to be an alter ego and or a free pass to eat candy with abandonment. 1. Start thinking and gathering ideas for costumes. Are you drawn to current events, movies, or maybe nature? Do you want to amplify a characteristic that is very much a-part of-you, or do want to create an alter ego? All of these questions are a great place to start when planning for a creative costume. Once you have a general idea of what type of costume you would like to create, starting looking for images to drawn inspiration. This is very helpful when creating a costume that is not premade. Make a list of colors, textures, and shapes that you would like to include in your costume. 2. Check your closet, basement and garage (yes, garage) for potential costume pieces. Before you going shopping, shop your own closet. Some of my best costumes have come from pieces that I already own. In college, I had a Twister Board Game that I turned into the cutest dress. I wore a purple wig and glued the game spinner piece to a headband. This costume took me about 20 minutes to make and I spent under $20 to make it. 3. Head to your nearest thrift store. Thrift stores are the best places to find unique pieces for costumes. Often times, thrift stores save their most unique donations just for Halloween! I went this year with a list for colors and textures that remind me of Babe the Blue Ox, a Lady Slipper and a Loon. I was successful in my search for the pieces to add to my Babe the Blue Ox costume and my Loon costume. I am normally able to create the majority of my costumes from thrift stores but oftentimes costumes need to have a few pieces created specifically. The Dollar Store is great for picking-up house hold items that can be repurposed into costumes. I purchased all the items needed to create my Hot Dish costume. I went to the fabric store to pick-up large amounts of felt, fake fur and shiny fabrics. All of the items I needed to embellish my costumes were on sale. Unlike department stores, I always find seasonal that seasonal items are on major discount. I looked at actual images of lady slippers flowers in nature to be inspired to make the Lady Slipper fairy costume. I like creating nature inspired costume as they are more of an artistic representation. All of the costumes I made are created with a glue gun! No need to create limitation for yourself- get some spray paint, a good scissors and glue gun and you’ll be able to create any costume that strikes your fancy. Michelle Raven and I met a few years ago when I was making the pivotal transition in my life from full-time corporate dweller to full-time dreamer, thrifter, and DIYer. As a savvy thrift store shopper, Michelle created an innovative (and free!) personal shopping service offered exclusively at Arc’s Value Village Thrift Stores. I work as one of Michelle’s guest stylists and it is one of my favorite creative jobs. I find it so rewarding to help clients achieve their wardrobe goals, all the while benefiting Arc’s charitable mission. In the past few years, many major life changes have happened for both Michelle and me. Since I’ve known her, Michelle has gotten married (check out her thrifty backyard BBQ wedding! ), bought a home and is now a new mother to her sweet son Sawyer! I was honored when Michelle asked me to collaborate with her on upcycling some thrift finds for her brand new baby’s nursery! Keep reading to see how I transformed some everyday finds into unique statement pieces that fit Michelle’s cabin-themed nursery, along with my ideas for simple DIY projects that can inspire and transform! Michelle purchased this white three-drawer wooden dresser at Arc’s Value Village in Richfield for under $25. It’s the perfect height to be used as a changing table, and the drawers allow for lots of extra storage. When creating beautiful, functional spaces, I always look for multipurpose & multifunctional pieces. In small spaces, this is especially key. The birch design detail on the front of the dresser drawers was created by simply applying this patterned project paper (found at JoAnn Fabrics), which was adhered with a generous layer of Mod Podge. First, I measured the dimensions of the dresser drawers. I then flipped the project paper over so that I could draw the drawers’ dimensions onto the non-decorative side as a cutting guide. I used a wooden yardstick to be sure the lines were straight. I placed the project paper on a large piece of scrap cardboard to use as a working surface. I then cut along the lines I’d drawn with an X-Acto knife. Once I had the three pieces cut, using a foam sponge brush (you can find these at any craft store for a few bucks), I applied an ample amount of Mod Podge to the drawers’ front surfaces. To ensure a smooth surface, I used a squeegee (you can pick one up at any hardware store for cheap) to eliminate any ripples or air bubbles. This project took a plain white dresser and turned it into a “wow” piece that fits the nursery’s woodsy theme perfectly. It took only a few hours from start to finish and, including the dresser itself, cost under $40! You can always find unexpected treasures at Arc’s Value Village that, with a touch of DIY, can add creative interest and character to any space. Michelle found this lighted globe for under $5 at the Richfield Arc’s. She was inspired by a similar painted globe she’d seen on Etsy, selling for over $200! With that as my inspiration, I set out to recreate it for Michelle for far less! I painted the phrase, Adventure Awaits with white multi-surface paint across the thrifted globe. You could use stencils or print free-hand, depending on the look you’re going for. As an added touch, I also glued rustic twine to the base of the globe to disguise the brassy, reflective surface that didn’t seem to match the rustic charm of Sawyer’s nursery. This crafty project transformed a basic thrifted globe into a piece of artwork. It took a steady hand and just a few hours to complete – and a bonus, the lighted globe serves as a soft light for cozy late night snuggles. Between the cost of the globe itself and the supplies I used, this project cost under $10. When I’m thrifting, I keep an open mind. A well-made piece may look drab at the store, but with a little paint or updated fabric, it can be totally reimagined! Michelle purchased this wooden shelf from the Arc’s Value Village in New Hope for $5. Her brother helped her sand it down and give it a fresh coat of brick red paint to give the room a pop of impactful color. Michelle created a gallery shelf to display family heirlooms (vintage duck decoy & child’s toy), thrifted trinkets (wooden MN cutout and Gone Fishing sign both from Arc’s Value Village), and art print from DogFish Media, purchased at Junket Tossed & Found. This wooden rocker was a family heirloom, passed down from Michelle’s mother-in-law (who also made the rustic flannel chair cushions for Michelle). The barrel, tipped upside down and used as a small table, was a thrift find from Arc’s Value Village and the vintage lantern was scored at E’s Emporium. Throw pillows bring instant and inexpensive style to any space. Pictured here, a burlap pillow (from Arc’s Value Village) and the other throw pillow is from Rank and File’s shop at Mall of St. Paul. Michelle created a simple gallery wall in the nursery by framing color-copied pages from one of her husband’s favorite childhood books. You can use pages from a book that’s special to you, or scour the children’s book section at Arc’s Value Village to recreate a similar wall art cluster. The custom wood sign was made by Michelle’s friend and client William Dohman of Oh Dier. What’s old is new again. Macrame wall hangings were popular in the 70s and there back in favor now. Michelle found this little gem at Arc’s Value Village for just a few dollars. What a hoot! This “bearskin” rug was handmade by one of Michelle’s loyal personal shopping clients, Lorri. I mean, does it get any cuter!? What cabin is complete with a deer mount? Michelle found this one-of-a-kind wall mount made of reclaimed wood at Scout Vintage Collective. And this rustic wood hook – Michelle found it in her backyard! With a little creative vision, almost anything can be turned into something decorative or functional, or both! P.s. How darling are the curtains Michelle’s mother-in-law made for baby Sawyer’s room!? Thanks again to Michelle for allowing me to be a part of this very special project! 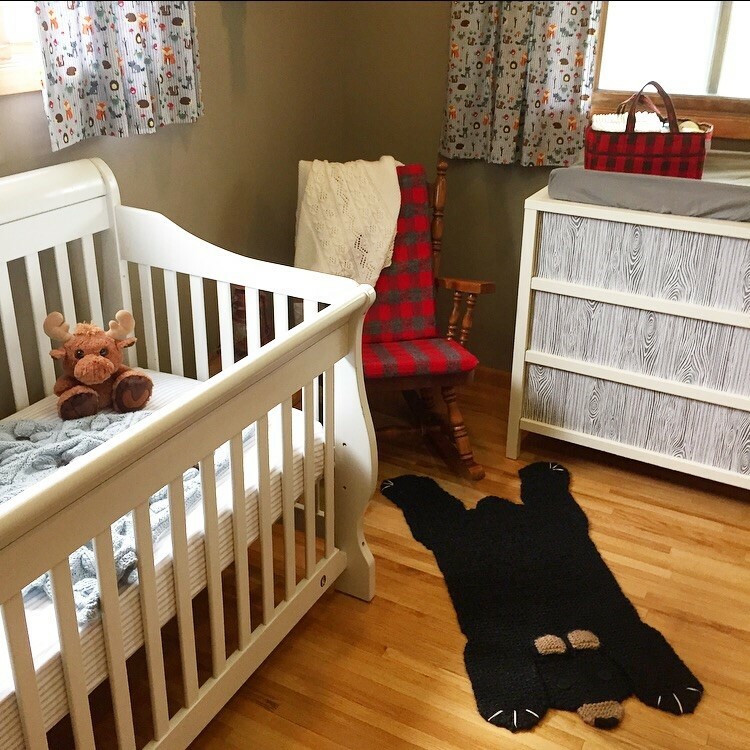 Sawyer’s got the perfect cabin-themed nursery to call home! I can’t wait to see all the Adventure that Awaits you, little baby Sawyer! Congratulations to the Ravens on their new addition! Who said Do It Yourself projects have to be done alone? Join us August 15th For A Hands-on Floral Arrangement Workshop! Click On Th Photo Above For All the Fun Details. Twin Cities Live, Craft Star! A dear friend called me on a Friday and encouraged me to create a video entry for the Twin Cities Live, Craft Star competition. The deadline was the following Monday so, I knew I had to make something, and quickly! Everything about this project and the potential it held was so enticing. I was delighted when I got the call that I was one of four finalists! One of the show's producers gave me the run-down of next-steps. She told me that I would have $150 to spend at Joann Fabric's & Crafts, to create a tablescape based on the theme I would choose at random, the day of the shopping spree. I met the other talented finalists, with the producer, and videographer. We all huddled around the fabric aisle to draw our theme. I pulled 'Baby Shower.' I grabbed a cart and headed to find some sales! This was the most challenging part of the whole experience! I knew I would look like a crazy lady, as I talked to myself the whole time planning my tablescape- but the efforts I put in the store would directly impact what I was able to create. I wanted to challenge myself by going through every aisle in the store. I looked for larger pieces that were inexpensive to add color, impact, and balance to the smaller crafts I would be making. Joann Fabric & Crafts has great decor props. I am talking like, 'Hello Create & Barrel.' The largest pieces on my table were all 70% off and can/will be used year round. Best Friends Forever. This fellow was the first goodie I put in my shopping cart. He was $7.50. Well, Hello Little Cutie! You are $12 And Coming Home With Me. With a full cart, I was ready to check-out. I spent $149.95! I spent nine days planning and making goodies for the Enchanted Baby Shower. Plant Trays are awesome to make into serving trays. I purchased various sizes and spruced-them-up with some paint. I kept the paint choices neutral so that I can use them often. Napkins- Folded in the cutest bow. Added felted shapes and moss with a colorful string napkin ring. Click This Photo For a Folding Tutorial. My Gal, Katie of Uncommon Creative Studio, is the Linen QUEEN. She's just amazing! Drink Tray- I bought a wooden slab, painted it with Martha Stewart's Chalk Board paint and added drawer pulls. The text, " Bottoms Up' is perfect for drinks or later to put this tray on a baby changing table for lotions and powders. Food Serving Tray- Flipped two ceramic lanterns over and added a wooden slab. Light metallic painting on wood with chalkboard paint border. This is a stylish and inexpensive solution to add height to your table. This is also a great trick to use when you have a small serving space, as food can also be served under this tray. I will be putting LED candles in these lanterns for an evening patio party with friends. The reflections will be pretty on a the serving table. Topiary- Add moss, small purple flowers, grape vines from my garden. Painted ceramic vases with metallic paint. Baby Banner- purchased chalkboard banner set. I swapped out the twine for a pretty ribbon. I also wrote the word LOVE on the other side of the banner. This will be a cute gift to give to the new parents to hang in the baby's room. I also used the 5th triangle from the banner to make a little sign for the DIY Sugar Scrub station. Sugar Scrub- Add two part sugar to one part coconut oil. Spray desired scent into sugar mixture. Decorate lidded jar with Shower theme trinkets. I found a great vintage- inspired plant mister while shopping at Joann Fabric's. I added my almond scent with water to this adorable vessel. Gnome- Add a personal message to gift to parents. This little guy is under $10 and can be enjoyed year round. Candles - Purchased a six-pack of glass, votive candles for under $6. These are great to wrap printed papers and ribbons around. These can easily be updated throughout your holidays by changing the paper and ribbons. Moss Hill- I love instant foam. You can purchase this for dirt cheap at the hardware store. This creates an organic shape. Paint and hot glue moss and miniatures. This will be cute on a bookshelf. Chandler & Baby Mobile- Use embroidery hoops, add simple shapes with a needle and embroidery string. This is great to tie to a dining room light fixture over your serving table. I am beyond thrilled to now have the opportunity to be a regular contributor on Twin Cities Live! Thank you so much for the outpouring of love and support from my friends and family. I am still cleaning-up moss in my house, but this experience is so worth it!